Borussia Dortmund attacker Mario Götze has brought up a century of Bundesliga appearances for the club by featuring against Eintracht Frankfurt. The man who got the winning goal for Germany in the 2014 FIFA World Cup final reached the milestone when he started in Dortmund’s Matchday 9 fixture at Eintracht Frankfurt. The news will come as another boost to the 25-year-old as he bids to return to his very best after a metabolic disorder kept him out of action from February to July of this year. Götze’s Bundesliga debut came on 21 November 2009, when then-Dortmund boss Jürgen Klopp sent him on in the 88th minute of a 0-0 draw with Mainz. Aged 17 years and five months, he was at that time the ninth-youngest player to have featured in the German top flight. The versatile and creative midfielder would play in only four more league matches that season but it soon became clear why Klopp had been willing to give him an early taste of life in the first team. Götze started the first game of the following campaign and - despite watching his side lose 2-0 at home to Bayer Leverkusen - Klopp kept faith with the teenager for the next match. That was a trip to Stuttgart on 29 August 2010, when Götze repaid his manager’s faith in him by netting his first Bundesliga goal in a 3-1 win. From then on, both Götze and Die Schwarzgelben would go from strength to strength that season. By May 2011 - a few weeks short of his 19th birthday - Götze had become a Bundesliga winner for the first time. 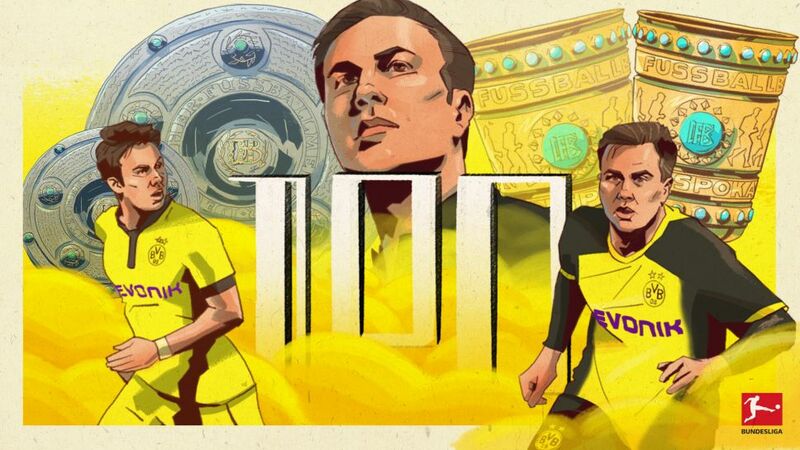 Thriving alongside the likes of Shinji Kagawa, Nuri Sahin and Robert Lewandowski, Dortmund’s newest star had weighed in with six goals and 11 assists as his club were crowned German champions for the first time in nine years. Watch: Götze's Top 3 BVB goals! A year later – albeit in an injury-hit season - he and Dortmund went one better. Once again, Götze scored six goals as Dortmund retained their title despite serious pressure from Bayern Munich. They then completed a league and cup double by hammering Bayern 5-2 in the DFB Cup final. Götze also helped Dortmund reach the UEFA Champions League final in 2012/13 but he left for Bayern that summer after 83 memorable Bundesliga matches in black and yellow. The Memmingen native scored on his return to Signal Iduna Park in a 3-0 win for Bayern in November 2013 before becoming a national hero after netting an extra-time winner for Germany in the World Cup final against Argentina. Germany manager Joachim Löw had told Götze during that game to “show the world you’re better than Messi”. In the summer of 2016 Dortmund’s prodigal son returned to the club as a five-time Bundesliga champion and three-time DFB Cup winner. He scored once in 11 league appearances in his first season back. The campaign ended with Dortmund winning the DFB Cup again but it was cruelly cut short for Götze when he was diagnosed with a debilitating metabolic illness. However, the hardship endured on the long road back for a player who first linked up with Dortmund as an eight-year-old would make any future success even sweeter. Götze has been used regularly by new boss Peter Bosz this season, one which Dortmund fans are hoping can culminate with him winning a third league title with the club.